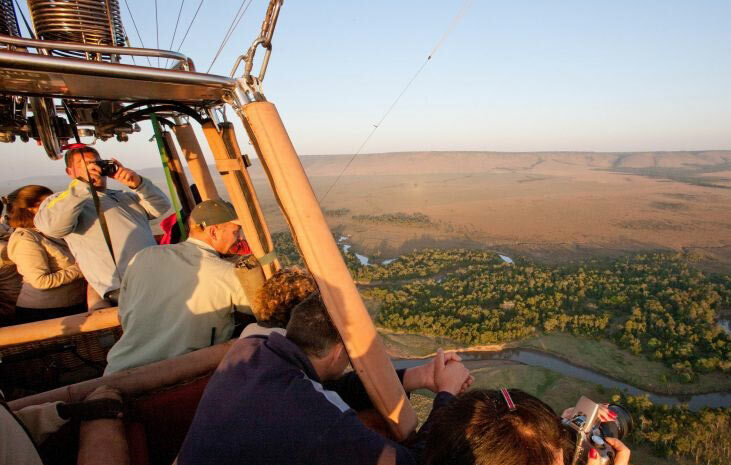 If you are on safari it is a must to go on a balloon flight. Not at all scary. Just dig in the old pocket and get on with it. The Balloon pilots are very experienced and we felt very safe all the time, even when "accidentally" clipping the trees. Saw lot animals including bat eared fox. The animals seem to be used to the balloons and don't take flight.The bush breakfast was as good if not better than on site. The return game drive produced many animals including a lucky sighting of Rhino. Oranje Safari offers Hot Air Balloon Safaris over the Masai Mara. This adventure usualy begins just before dawn. You’re off for a wildlife viewing adventure with an entirely different perspective of the Masai Mara. Something that amazes most first-time balloonists is the wonderfull stillness: the silence as you float above the plains is a unique experience. The flight lasts about an hour while drifting wherever the air currents take you. You can take some amazing pictures and movies.Your hot air balloon trip will end in style with a diner, you will toast your return to earth with a champagne breakfast, cooked wherever you land.